A new Purchased Services benchmark product is now available through Medpricer based entirely on competitive electronic bidding results to help healthcare systems determine whether they have the most competitive rates and terms. 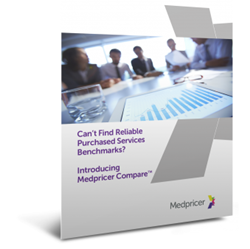 Medpricer Compare - Healthcare industry's leading purchased services benchmarking report based on real competitive bidding results used to identify realistic savings opportunities. Because purchased services account for approximately 40% of a health system’s supply chain costs, it becomes more important than ever to have the right data needed to uncover additional savings opportunities, and Medpricer Compare™ helps them to do that. Medpricer, healthcare’s leading cost management platform for purchased services, announces the debut of its new benchmarking product Medpricer Compare™, which provides healthcare systems with accurate category benchmarks for purchased services enabling them to identify realistic savings opportunities. Medpricer Compare™ is a customized assessment that compares what a health system is spending in chosen categories against Medpricer’s $14 billion sourcing benchmark database based entirely on competitive bids. This information is adjusted for unique purchased services factors such as geography, volume, service level, and category specific requirements. In addition, Medpricer’s deep category expertise is applied to produce a final report that provides a healthcare system with a comparison of what it should be paying against its current contracted rates. Different than other benchmark solutions geared more towards medical-surgical and commodity products, Medpricer’s database is based on purchased services competitive bids and evaluates all potential cost drivers to determine true competitive rates. It is built from sourcing over $2.7 billion with more than 400 national and local suppliers to provide the most accurate cost comparison and realistic savings opportunities. Call Medpricer at (888) 453-4554 to request a sample Medpricer Compare™ report or click here for more information about how you can uncover an average of 24% in Purchased Services cost savings opportunities in your organization. Medpricer is healthcare’s leading cost management platform for purchased services and offers the industry’s only comprehensive Purchased Services System to blend cloud-based technology with on- demand professional services. Using Medpricer, healthcare providers can realize an average of 24% savings and a 40% faster sourcing cycle while paying no out-of-pocket costs.